Why is Michael Di Biase still Chair of Planning and Economic Development at York Region? In April 2015 the City of Vaughan decided to dock Regional Councillor Michael Di Biase's pay for 90 days on the grounds that he had improperly interfered in the Council's tendering processes. The decision followed a report from the City of Vaughan's Integrity Commissioner who is independent. Di Biase cried foul and protested his innocence. He said he would challenge the decision in Court. The matter came before the Assistant Chief Justice of the Superior Court of Ontario, Frank Marrocco, and two of his fellow judges, Carolyn Horkins and Michael Varpio. "There is no merit in any of the applicant's (Di Biase) submissions." "The maximum penalty that may be imposed by the Council is a suspension of pay for 90 days. The applicant cannot lose his elected position, and the Integrity Commissioner cannot make the applicant civilly liable. The decision is important to the applicant because it affects his reputation." 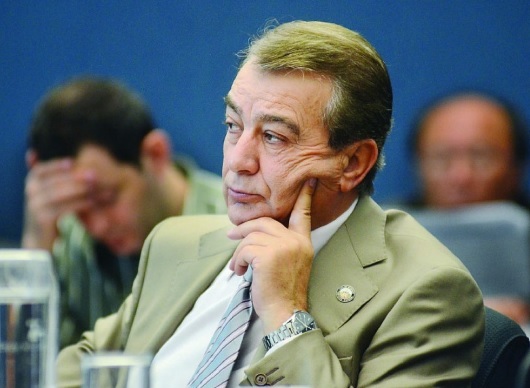 Di Biase serves on two municipalities; his home City of Vaughan and York Regional Council. While Di Biase forfeited his City of Vaughan salary for 90 days he continued to claim his full salary from York Region. In 2015 he received $54,071 in salary plus $8,949 in benefits and $2,104 in expenses from the Region. The report from the Integrity Commissioner which triggered this series of events makes jaw-dropping reading. At the time I called on Biase to volunteer to give up three month's pay from York Region and stand down as Chair of Planning and Economic Development on the grounds that his integrity and impartiality had been totally compromised. Biase's colleagues on the Regional Council turned a blind eye to his transgressions. They felt able to do this because, astonishingly, the Regional Council has no Code of Conduct for its members. And without a Code of Conduct there is no need for an Integrity Commissioner. At their meeting in October 2015, members decided that a Regional Code of Conduct wasn't needed. Michael Di Biase is clearly the wrong person to be chairing Committee of the Whole meetings when far-reaching planning and development issues are considered. But will anyone on York Regional Council do something about it? Note. This blog was amended today (14 November 2016) to make it clear that York Region has a Committee of the Whole structure in which Planning and Economic Development matters are put forward by the Chair, Michael Di Biase, to the Committee for its consideration and decision.